Bristol Street Style - Very Magazine Feature! In November I was contacted by Very.co.uk magazine, a new monthly mag which comes within the OK! magazine multi pack and is also sent to Very customers. 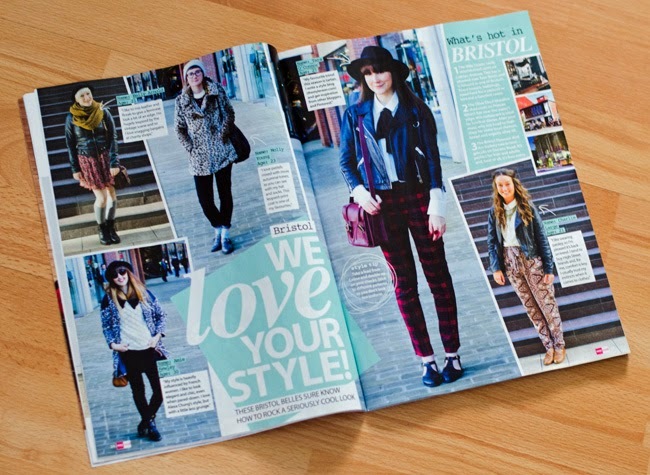 Each month they have a street style section and this month they wanted to feature Bristol! I was given the task of snapping stylish girls and I was prepared for it to be a somewhat tricky task... mostly because when I took photos for Motel at Glastonbury, the majority of stylin' festival goers didn't want to be photographed. Seriously. Thankfully, the fashionistas of Bristol were totally up for it which made my job that much easier! I photographed about 12 girls and the publishing team picked their favourite outfits for the feature (including me, huzzah!). I found the whole experience really fun and met some lovely people - I just want to do it all over again! I also put together a list of my top 3 things to do in the city. Gok Wan has described Bristol's style as slightly more individual, grungier, and a little bit more studenty compared to somewhere like Liverpool which is very glam and dressed up. I definitely agree with that assessment. Whenever I go to Liverpool with Jade, I'm always surprised by how glamorous the girls are and how much effort they put in. Almost everyone has a full face of make up, their hair styled and are rocking heels just to hit the shops! Even Jade goes shopping in heels. She's the glam one and I'm the grungey one. Fact. Saying that, I'm quite happy with my relaxed style, it's just the norm down here. You may notice the uber stylish Amie of Credit Crunch Chic was also featured. I love Amie's style and I just knew her snap would make the magazine. Doesn't she look awesome? Are you a fan of Bristol's laid back style? T you look so beaut! I love those pants! Congrats again T! <3 Love this little feature & the way all the girls have that exact 'laid back, grungy but individual' style you described. I'm definitely a fan of more laidback too, although I do put a bit of effort into the way I look, I kinda like to look as though I haven't! Also, I love love love those trousers!